Costa Cruises will become the first cruise line to make a public food waste reduction target. With the launch of the “4GOODFOOD” program, Costa Cruises is aiming to reduce food waste by 50% fleetwide by 2020. This is 10 years earlier than the deadline set by Agenda 2030, confirming its role as a leading company in the sustainability field. Winnow is a key partner to reach this ambitious target. As pioneers in the global cruise industry, Costa Cruises – the Italy-based cruise line and a part of Carnival Corporation & plc, the world’s largest cruise company - is focusing on food waste reduction at the production site with Winnow’s technology, while also engaging Costa's guests and crew members on the value of food and responsible consumption. As part of their “4GOODFOOD ” programme, Costa first piloted a number of projects to reduce food waste on Costa Diadema, their flagship vessel. 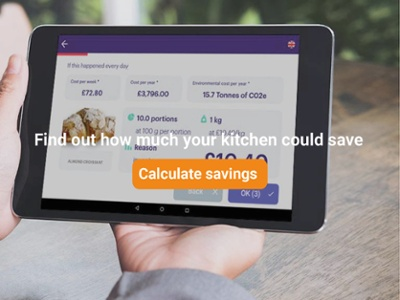 This included measuring and preventing food waste with Winnow, using the “Taste don’t Waste” programme to help educate guests about minimising leftovers, and donating any food to Banco Alimentare. The programme kicked off with Winnow in early 2017 to tackle food waste by providing chefs and their staff with data to run a more efficient operation. Winnow is now playing a crucial role in the mapping and revision of processes on board, as well as in the evolution and development of Costa’s food service system. Today, we’re proud to announce that Costa Diadema has already exceeded the target of a 50% food waste reduction. Costa Cruises’ new initiatives targeting food waste reduction helped prevent on Costa Diadema over 1,189 tonnes of CO2e being emitted every year. This is equivalent of removing 231 cars from the road for an entire year. Based on the success of the initiative, Costa is now rolling the programme out to its entire fleet. Today, over half of the Costa ships are live with Winnow. The plan is to complete the rollout on all the company’s ships in Europe and Asia by this summer. While the “Taste don’t Waste” consciousness-raising campaign is already live on the entire fleet as of December 2017. “Winnow has a crucial role in the food waste mapping thus enabling the revision of food production processes on board undertaken by our chefs. We truly believe that together with Winnow we have the potential to change the culture in our galleys, transforming the way the cruise industry prepares food forever.” - said Stefania Lallai, Sustainability and External Relations Director at Cost Cruises. “We are inspired by Costa Cruises’ vision and are excited to support them in leading the industry on the issue of food waste. Reducing food waste makes both economic, environmental, and moral sense. It is a no-brainer for the industry.“ - added Marc Zornes, Winnow Founder. Tackling food waste is a huge opportunity for the cruise industry as a whole. It can really be a transformational step change. It makes economic, environmental, and moral sense. By setting such a bold target, Costa Cruises is setting an example for the rest of the cruise industry.